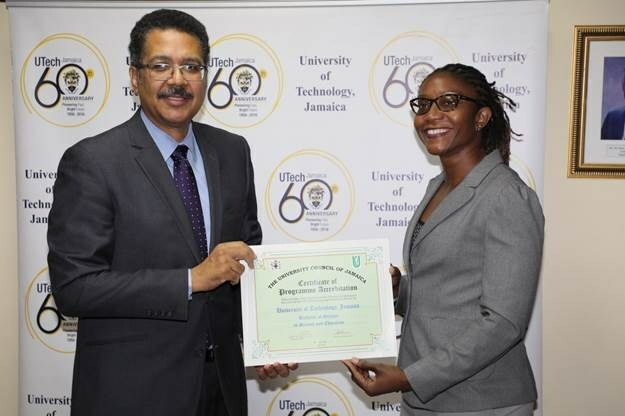 University of Technology, Jamaica Receives Accreditation for its Bachelor of Science in Science and Education — UTech, Ja. President, Professor Stephen Vasciannie presents The University Council of Jamaica (UCJ) Accreditation Certificate for the Bachelor of Science in Science and Education to Dr. Kamilah Hylton, Dean, Faculty of Science and Sport at a presentation ceremony held in the President’s Conference Room, University of Technology, Jamaica Papine Campus on September 26, 2018. The University of Technology, Jamaica has been granted programmatic accreditation by the University Council of Jamaica (UCJ) for its Bachelor of Science in Science and Education (BSSE) offered by the University’s Faculty of Science and Sport. The decision of the University Council of Jamaica to grant accreditation to the University of Technology, Jamaica’s B.Sc in Science and Education programme was formally conveyed to the President of the University of Technology, Jamaica, Professor Stephen Vasciannie, in a letter dated July 11, 2018 from the UCJ’s Chairman, Dr Carolyn Hayle and its Executive Director, Mrs. Althea Heron. Professor Vasciannie in a ceremony on Wednesday, September 26, 2018 at the University’s Papine Campus presented the formal certificate of accreditation to Dean of the Faculty of Science and Sport, Dr. Kamilah Hylton. In his remarks Professor Vasciannie noted that the accreditation of the B.Sc in Science and Education programme is a good forward step for the institution. 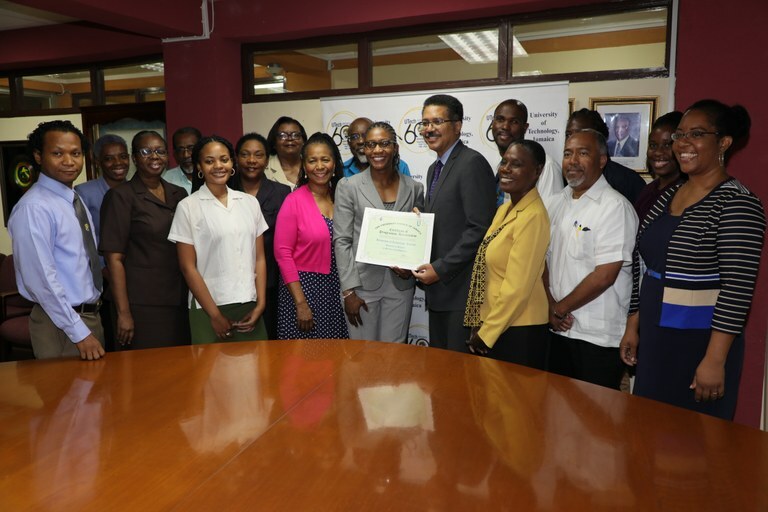 He acknowledged the perseverance and extensive efforts put in by the internal team led by Dean, Dr. Kamilah Hylton, Associate Vice President, Quality Assurance, Dr. Winsome Russell and others in overcoming the challenges in obtaining accreditation for the programme. Dr. Kamilah Hylton in her remarks spoke to the tremendous national value of the programme to the education sector, having produced several cohorts of teachers of Science Education. The programme with specialisations in Biology, Chemistry, Mathematics and Physics prepares educators to teach up to Grade 11 in their majors and up to Grade 9 in their minors. Happy smiles adorn the faces of faculty members, administrators and students who played a role in the process of accreditation. Front row (L-R): Dr. Andrew Lamm, Director, Centre for Science-Based Research, Entrepreneurship and Continuing Studies, Faculty of Science and Sport, (FOSS), Dr. Beverley Myers, former Vice Dean, FOSS, now Lecturer, Ms. Naomi Thompson, final year student, B.Sc. Science and Education, FOSS, Dr. Winsome Russell, Associate Vice President, Quality Assurance, Dr. Kamilah Hylton, Dean, FOSS, Professor Stephen Vasciannie, President, , Miss Gerlyn Gray, Accreditation Officer/Lecturer, FOSS, Mr. Patrick Williams, Vice- Dean, FOSS and Dr. Kerry-Ann Wilson, Lecturer, FOSS. Back row (L-R): Mrs. Donna-Marie Wynter-Adams, Head, Caribbean School of Sport Sciences, Mr. Herter Wilmot-Simpson, Physics Lecturer, FOSS, Mrs. Audrey Hussey, Senior Lecturer, School of Public Health and Health Technology, Dr. Marcia Andrade-Campbell, Senior Lecturer, College of Oral Health Sciences, Dr. Junior Martin, Head, School of Technical and Vocational Education, Faculty of Education and Liberal Studies, Dr. James Smith, Head, School of Natural and Applied Sciences, FOSS, Mr. Dwayne Hibbert, final year student, B.Sc. in Sport Management/FOSS Student Representative and Ms. Donna-Marie Newby, Programme Director, FOSS.